As we’ve been updating and re-releasing WRAP books and other materials, you’ve no doubt noticed some adjustments and enhancements to the materials. We’ve added new examples, created new prompts to help you build your WRAP, updated some of our language to better reflect the WRAP values and ethics, and revamped the visual design—to name just a few of the changes. One bigger adjustment that many folks in the WRAP community have asked about is the changes to the section titles in the crisis plan in the new red book, workbook, pocket plans, Veterans book, and WRAP app. What’s going on? Well, let’s talk about it. WRAP was developed in 1997 in Vermont by a group of peers who were searching for ways to overcome their own mental health issues and move on to fulfilling their life dreams and goals. These individuals who came together were looking for simple, safe, practical things they could do for themselves to support their wellness and a way to organize those strategies into a plan or strategy that they could share easily with others as well as personalize it for their own lives. One of those people was Mary Ellen Copeland, who had been studying how people get well, stay well, and move forward in their lives. Working with this group and many, many other peers, Mary Ellen developed the WRAP process we know and love today, starting with the WRAP “red book” and later including dozens of books, recordings, and tools for Facilitators, including a Facilitator Training Manual and best-practice peer group model for sharing WRAP. Research on the WRAP peer group model has shown that WRAP is an effective tool for supporting positive changes in our lives, such as increasing our sense of hopefulness in our own recovery, building our awareness of our own early warning signs and triggers/stressors, increasing our use of wellness tools in our daily routine, empowering us to plan ahead for a crisis, and helping us build a social support system. For those of us using WRAP, myself included, we already knew this because we are living WRAP every day and see the positive changes it’s helped us create in our own lives—but research that proves how powerful WRAP is is always a good thing! The information and materials you find in the WRAP Facilitator Training Manual and in evidence-based peer-co-facilitated WRAP groups are based on that proven model. When you participate in WRAP peer groups led by certified co-Facilitators, that evidence-based model is exactly what you’re going to get. That’s why we so deeply value the certification process and ongoing refreshers for WRAP Facilitators: when everyone gets the same training and stays plugged into WRAP, we’re all using the same materials, maintaining the same values and ethics, and sharing the same high-quality program as it was designed to support us in our in wellness and recovery from mental health challenges. Learn more about the way WRAP works and how you can share the evidence-based model. What’s so amazing about the WRAP model is that we can use it for any area of our life or our goals. We may not have the formal evidence base with other areas that we have for mental health, but the anecdotal evidence is huge. Just from my own experience, I’ve used WRAP for my mental health and also for the medical crisis of my complicated twin pregnancy, the experience of parenting twins, work and school transitions, improving specific relationships with people who are important to me, moving cross-country (twice! ), managing chronic health issues, and more. I’m sure the folks reading this can add many, many more items to the list! What has been challenging for some of us, though, is that parts of the WRAP materials were so specific to mental health applications that it was difficult to see how to use WRAP for areas other than mental health. For those of us already using WRAP every day, we get it. But some folks just finding WRAP for the first time reported struggling with making it fit for the areas they wanted to address because it was mental health-focused. (If I’m being honest, I struggled with that at first, until WRAP became a part of my everyday life.) As our team updated WRAP materials, a big goal was to make WRAP more accessible to ANYONE who wants to make powerful positive changes in their life in ANY area or areas—including but not limited to mental health. Although the evidence-based WRAP peer group is the “gold standard” for WRAP, it’s also not available to everyone at every point in their life. For example, when I lived in northern Virginia, where I first discovered WRAP, I had a lot of options for WRAP groups and WRAP-based peer support; here in rural Colorado, not so much—in my area, I’m the only certified WRAP Facilitator for more than 50 miles! As more and more people become Facilitators, that will change. Meanwhile, the WRAP books, app, and other materials play an important role in empowering those of us who can’t get to a group or can’t attend often to still develop and maintain our WRAP both within and separate from a WRAP group setting. That’s why we made the crisis plan headings, as well as some of our examples and explanations through the materials, a little broader and incorporated a variety of applications and life experiences. 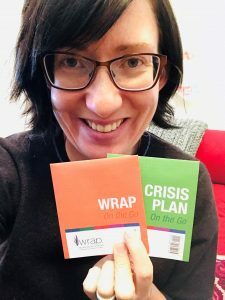 Now, when people pick up a WRAP book for the first time and look at the crisis plan, they see a more general approach to what a crisis might look like. They can tackle mental health or addiction challenges, and they can also tackle chronic health, housing, employment, relationships, and more without having to “make it fit”—because this is a plan for any crisis. This is what I look like when I’m well. This is what I look like when it gets too bad for me to handle on my own. When I’m in a crisis, I want the following people to support me in these ways. When I’m in a crisis, the following people should not be involved in making decisions on my behalf. If supporters disagree on a course of action, I want them to settle the dispute in this way. When I’m in a crisis, please do these things to help me feel better and get back to wellness. When I’m in a crisis, please do NOT do these things, which would not help and would make things worse. A: At first glance, that certainly seems to be true. In the general books and materials, we took out specific words like medications, treatment facilities, etc., because those are things that may not apply to every crisis. If those items are important parts of your crisis plan, there are still places to include those things in the new materials under the sections about things that help and things that make it worse. The headings might be different, but there is space for everything we already have in our crisis plan in the updated materials. It’s also an easier fit for any type of crisis we may be experiencing, whether it’s the crisis of starting smoking again after quitting, or the crisis of going through a divorce, or the crisis of bankruptcy, or anything else we may be dealing with in our lives. As with any other part of WRAP, you can develop it in whatever way makes sense to you. There is no wrong way to make your crisis plan. This is your crisis plan, and you absolutely can and should make it work for your needs. You are the expert on what crisis looks like for you and how you want other people to support you. Personalize your own crisis plan however you see fit. A: When you attend an evidence-based WRAP peer group in the future, you’ll still get the original WRAP crisis plan that focuses specifically on mental health crises and is part of the evidence-based practice model. When we complete updates to the Facilitator Training Manual, which is currently in process, you’ll also have the option of using the more general headings that appear in the updated materials or, of course, making up whatever headings feel right to you. As in all areas of WRAP, Facilitators are not there to give final answers. Facilitators are there to offer choices and options and invite participants into a process where they can powerfully create their wellness their way. A: This is a new crisis plan option that came from suggestions from the WRAP community. As we create our crisis plan, we get to define what a crisis is for us and what we need for support for that crisis. Once we make that decision, we have all of the options of the evidence-based practice and the more general headings available to us. As with all things in WRAP, each section or idea is just an option, so if it doesn’t apply to the crisis you’re planning for or if you don’t connect with this language, please cross it out, change it, leave it blank, or whatever else feels right to you. There are some issues that come up for us in crises that are in a “gray area” or are just completely unexpected, and we might want our trusted supporters to bring them to our attention and support us to take care of them. They may not be on the list of things we need someone to do for us or signs things are too bad for us to handle on our own, but they can still cause problems for us if they’re not handled. This section is an opportunity for us to specify, if we want to, how we want our supporters to respond if they notice something that seems off or seems to be creating problems for us. We can also use this section to tell our supporters we don’t want them to address anything not specifically included in our crisis plan, which is always an option. There have been many times where something happened that was causing a problem for me or for other people in my life that I wasn’t able to notice or deal with during a crisis, and I have been very grateful to my observant and loving supporters who could bring this to my attention and help me take care of it. For example, I recently had a crisis where I was too unwell to handle many things at home or at work. It snuck up on me, and even if I had had a full crisis plan in place, these things wouldn’t have been on my list because they arose in the moment. One of these issues was that I wasn’t able to read or respond to emails at work and I missed some project deadlines, causing a chain reaction that certainly had a negative effect on others. My extremely supportive boss noticed this happening, reached out to me via text to check in, and then communicated with my colleagues on my behalf until I was feeling better. As another example, this one from a supporter perspective, one challenge I’ve experienced in the past was noticing an aging family member’s increasing likelihood to lose their balance and fall, which often resulted in serious injury. Especially because my family member lived alone at that time, this was potentially a very dangerous situation. Their declining health was a crisis, and we did not have a plan to follow. I and their other supporters struggled to figure out how to empower them to protect themselves from injury without making decisions for them or taking away their autonomy. I would have appreciated a plan with this section in it so that I knew I was supporting my family member in the way they wanted. We ultimately made it work, but it was really hard. In other words, this section is an option to provide some general guidance about how we want our supporters to advocate for us and support us around things that aren’t otherwise specified in the crisis plan but may still be part of our crisis. Do you have additional questions about WRAP or our revised materials? We’d love to hear from you! Please comment on our Facebook page. In case you missed it: The WRAP App is back! Download for free for iOS or Android. Watch the Facebook Live App Walkthrough.